An attorney and lung cancer survivor, David was diagnosed 22 years after he quit smoking and a little over one year after he climbed Mt. Kilimanjaro. He underwent surgery for removal of two lobes of his right lung. Like many people, after his diagnosis, David became acutely aware that lung cancer lung cancer does not receive the research funding commensurate with its toll on public health. 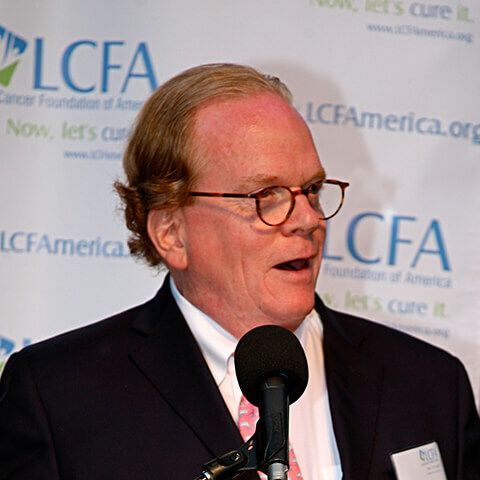 As a result, David became a fervent patient advocate, originally as the Lung SPORE representative at UCLA, where he met LCFA co-founders Kim Norris and Lori Monroe. David was then invited to serve on the United States Department of Defense’s Congressionally Directed Medical Research Programs’ Integration Panel, and was the sole patient advocate at the table for the groundbreaking National Lung Screening Trial’s Data and Safety Monitoring Board (DSMB). David has also petitioned lawmakers in Washington, DC, in order to increase funding for lung cancer research. David lives in Minnesota.